(2, 12, and 79) here (PDF format). Not A Wake is the first book ever written completely in Pilish, that peculiar dialect of English in which the numbers of letters in successive words follow the digits of the number π (3.14159265358979323846...). Divided into ten sections of 1000 digits, each written in a different style, its words "spell out" the first 10,000 digits of the number. Drifting alongside forests simmering red in the twilight over Europe. As you can see from the red numbers, the lengths of the words faithfully follow the digits of π. This continues in an unbroken stream to the end of the book, encompassing 10,000 digits in all (the last of which is a "7"). - Georges Perec's La Disparition, which does not contain the letter E.
- Christian Bök's Eunoia, in which each of the five main sections is a univocalic in one of the five vowels. - Walter Abish's Alphabetical Africa, in which the initial letters of words are constrained in a certain way. a dog lying quietly under a strange tribunal. climbed to the throne, as the anti-church king mostly rejected them. 3 97 haiku on a wide variety of subjects. 4 Two intertwined poems which blend together as their narrators meet. 5 A surrealist poem in 14 stanzas. 7 A dream about puzzles, containing two newspaper-quality crosswords with Pilish clues. 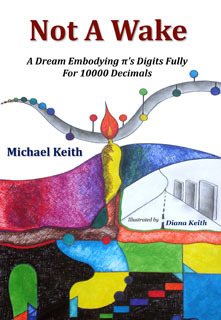 9 Three poems and a stage play, each with an illustration that encodes some digits as well. 10 Ah, this one's a surprise! Not A Wake can be purchased from Amazon.com by going here. It is available as both a paperback (at a list price of [π2 + π/2] dollars, though Amazon usually offers it at a reduced price) and as an ebook for the Kindle platforms (Kindle reader, Kindle for PC and Mac, and Kindle for iPad) for a mere π dollars. If you would like an autographed copy of the paperback, email me.